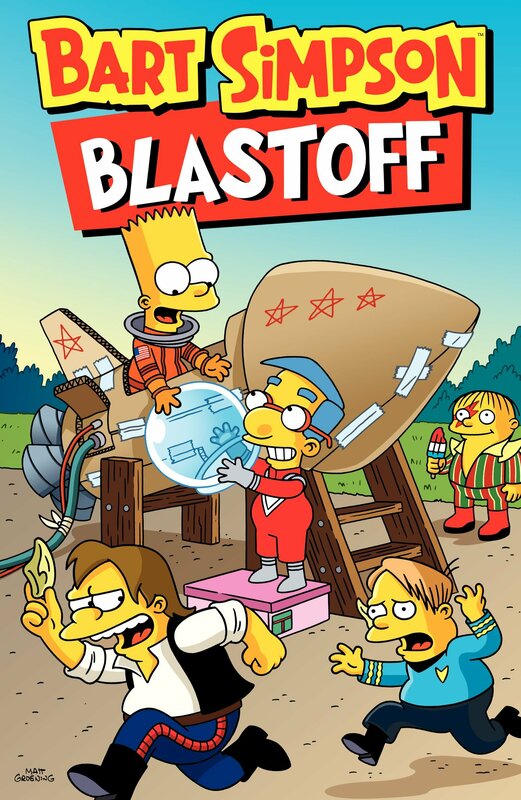 Bart Simpson Blastoff is a Bart Simpson compilation book, it was released on April 22, 2015. "Countdown to laughter! Bart Simpson will send you over the moon with high-octane hilarity as he leads the Springfield Elementary team to the state eating competition, does his best not to embarrass Marge on Mother’s Day, learns a Kwik-E life lesson from Apu, gets a little bedtime assistance from Maggie, bonds with Grampa over a junky jalopy, and foils Mr. Burns plan to sidestep Springfield’s child labor laws. Then, Lisa gets some surprising competition as she squares off against Bart in a contest to win a prized pony, teenagers Homer and Barney encounter zombies, and much, much more! It’s a supersonic, supercharged, Bart Simpson shebang!" Modified on February 10, 2018, at 14:49.